The Jolly Snowman painted on our red sleigh proclaims Snow, and all his buddies are in the sleigh ready to make their way to a lucky home or office. 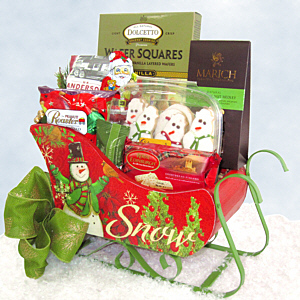 The Snowmen in this Sleigh are Gianna's All Natural Sugar Cookies, a Chocolate Santa is along for the ride as is The Peanut Roaster Honey Roasted Peanuts, Royal Edingurgh Shortbread, Marich Chocolate Nut Medley, H.K. Anderson Chocolate Pretzels, Dolcetto Vanilla Wafer Cookies and a Coconut Delight. A delightful gift that will be used for years to come.